14 February 2002. The day Kannathil Muthamittaal released. 10 Years of being a playback singer. Despite several hurdles. Thank you Rahman sir for the god-awesome break. Thank you for your blessings through these years. I have looked upon you as a Guru. Thank you Mani Ratnam sir for retaining my voice. Grateful that the first ever song I sang were Vairamuthu Sir's lines. To Mani Sir and Priya V and Dhina Sir for making me sing the title track of Anbulla Snehidiye introducing me to a wide audience before Kannathil Muthamittal released though KMI was recorded first. OrU Deivam was the best ever break one could ask for in films. It was a prayer answered. A wish fulfilled. A dream come true. Though I guess I recorded the song sometime in December 2000 and subsequently in May 2001, the release is what marks the entry of an artiste in films. If that break didn't happen nothing else would have followed. At a time when I thought I was going to be written off, I got a second break of sorts with Sahana and for that I am grateful to AR sir and Shankar sir. To Harris sir for his kindness and for giving me a chance to sing a composition like Varayo that led me to win almost all the awards in 2010. Raja sir for his kindness in giving me an amazing opportunity to sing in his concert in Italy, at one of the oldest and best opera houses in Modena, though I hadn't sung for him in films at all except the short Engu Pirandhadhu, which incidentally happened after this concert. It was an experience to cherish. To Paul Jacob, for whom I faced a studio mic for the first time for a jingle. To S A Rajkumar sir, Dheva sir - who has probably given me the most number of songs in all this while and Srikanth Deva sir, Imman, Ramesh Vinayagam anna, Dhina sir, Selvaganesh ji, Bharadwaj sir, Vidyasagar sir, G V Prakash, Taj Noor, Yuvan Shankar Raja, Bhavatharini, Premgi Amaran, Sathya C, Ghibran, Joshua Sridhar, Fen Viallee, Devi Sri Prasad, Mr. James Vasanthan, M Jayachandran ji, Ouseppachan sir, Mr Samson, Sri Chinna, Sadhu Kokila ji, Mithoon and every composer who has thought of me and allowed me to be the voice of their creation. I hope I will not be in soup if I have failed to mention a composer's name. If I have, I shall stand corrected and humbly request pardon. Grateful to the print/TV/Radio media (presenters on TV and radio) for writing/speaking about me. Grateful to the sound engineers that make me sound good, the musicians who have played for me at various concerts. Thankful to the artiste coordinators and PROs. Grateful to Mr Krishna who took the risk and invested the time in giving me the opportunity in dubbing. To Mr Gautham Vasudev Menon thanks to whom I got the first Nandi award for Ye Maaya Chesave and my debut in Telugu and Hindi through YMC and Ek Deewana Tha. SICADU the dubbing Union and the musicians Union for their understanding and support. To Neelambari and Rajkumar for working with me and training me to be a TV show host. C S Amudhan and Aahaa FM for letting me dabble in hosting on radio. To everyone who was part of a jury that gave me an award. To audience who voted at various times whenever applicable. To the Tamilnadu and Andhra Pradesh State Governments for bestowing me with the honour of the State awards. To my well wishers and those who like my singing. My mom. From her I was born. From her I learned to sing. And because of her I continue to exist. No mommy. No Chinmayi. No singer called Chinmayi. God. For being nice. As for the really trying times, I guess I don't know if I should thank you for those, because I still don't see the point and I don't forgive you for a lot of things. But, I still like you. And hope you like me too. To you having had the patience to read this, thank you. From an introverted, quiet girl I have come a long way. I have existed as a playback singer because of the kindness of all the composers and directors. Otherwise, I guess I will continue to keep evolving, learning and improving. With the knowledge and confidence that my mother will guide me through the rights and wrongs and God will stand by us. I am not sure how many more months/years I will continue to get opportunities as a playback singer, in this day and age and I am grateful for every single day, every single opportunity. I happened to catch up with a few of my school-friends over dinner. More often than not, when I am probably given a notice of say, a week or 10 days, for such a rendezvous, I usually don't make it. But this was fixed in a 2 hour notice and thankfully I wasn't expected to be at some studio yesterday and finally made it to probably one of the nicest evenings I have had. Talking of school, my best times were at Hindu Senior, Indira Nagar. Our Principal then, Mr V Venkatachalam, IMO was super dynamic, let us be what we wanted to be. He would allow one of my classmates to come 3 hours late to school because he was training to be a tennis player. I can't think of any other school that would allow that. He let me go to an All India level competition with barely a couple of weeks left to go for the board exam. I came first in that thankfully but I appreciate his vision even more now. Somehow, the best memories are of school for me. Maybe it is true for a lot of people. I remember one of our classmates was really good at imitating teachers and hence when my Physics teacher, Swarna ma'am came to know of it she asked him to come forward and perform, for the benefit of the entire class and herself. We were initially scared but it was even more fun when our teacher joined in and laughed when she saw her student imitate her. Last night we spoke of a whole lot of things, school, classes, the super performers, sports day and PE teachers, throwball teams A and B, who was brilliant, who broke fingers and throw ball was the one sport I was actively involved in school. And the HSSS hosted the SDK Throwball cup and somehow Hindu won each year coz we were the best. Quite proud of this. :D I have romanced the idea of some sort of a throw ball match reunion but God knows if that will ever happen. The throw ball matches were fun for the boys in school basically because they got to see entertaining games between girls of various schools who would land up in our playground. And we perhaps had one of the biggest playgrounds then. I hear the ground isn't there anymore and I can't bear to go back and see it. Probably at that age, we would split hair about who got more marks or who performed better in some sport. But looking back, for me, it was a beautiful phase in my life. And as my classmate told me, we were all friends with each other in the purest form. No ulterior motives. She said by the time we are in college the friendships that forge there are very different from the ones forged at school. Over the dinner table, watching my friends talk of career, family, parenthood, school, college, home, cleaning, gardening I wondered how and when time flew. It seemed like yesterday that we were in eighth standard. Staircases and corridors, blackboards and chalk pieces, question papers and answer sheets and the red numerators and denominators within a circle. Looking out of the window before I type this line, I don't wish to go back to that time. It has served its purpose. There will always be a part of me that is frozen in that 8th standard. An age of innocence, simple joys and simple sadnesses, simple challenges and simple solutions. No matter how grown-up and adult the society expects me to be. The child in me is forever alive and kicking. 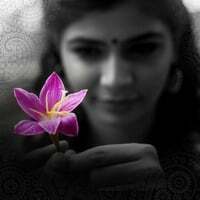 Perhaps at the end of the journey of living as Chinmayi I hope to figure out the reason behind it all. And I hope it would end with a relaxed smile.